This is a coupon for the Tune Toddlers online store. 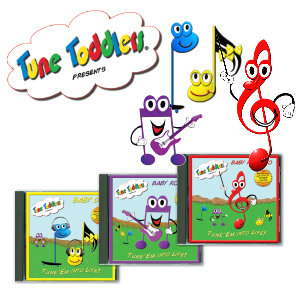 The Tune Toddlers CDs are designed to teach music as a primary language. Your baby can learn music as naturally as they learn other communication skills. It's a fun and easy way to nurture your child's musical ear. "Tune Toddlers is dedicated to teaching children the universal language of music, so they may fully experience and inspire greatness through the art of sound." Music is traditionally taught as a secondary language. Tune Toddlers is designed to teach music as a primary language. Your baby can learn music as naturally as they learn other communication skills. It's a fun and easy way to nurture your child's musical ear. Play at nap time or play time...a few times a week. To learn more about Tune Toddlers , visit their official website here.